Members of The Showroom Parkour Club are looking to the future with excitement after Parkour, the discipline of movement, has now been officially recognised as a sport by the UK’s Sports Councils. The formal recognition of Parkour/Freerunning as a sport came on Tuesday, January 10, 2017, announced by the Minister for Sport, Tracey Crouch, at Westminster Academy’s L.E.A.P. Park – currently the UK’s largest outdoor Parkour and FreeRunning facility. “I want people to get out there and find the sport and physical activity that appeals to them and Parkour is certainly a fun, creative and innovative option” said Tracey. Throughout Parkour’s massive growth over the past two decades, the media coverage of the sport has led to controversy and misinterpretation of what the sport actually is. The sport has recently been targeted at the ‘over-60’s’ demographic by The Parkour Dance Company based in London, with sessions focused around maintaining mobility and reducing hospital fall admissions. 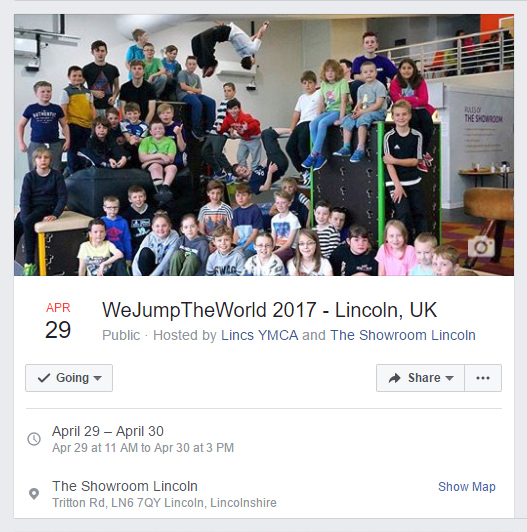 The Showroom Parkour Club hopes to offer similar opportunities outside of its regular clubs, and has recently announced it will be taking part and hosting a Parkour ‘Jam’ for the international ‘WeJumpTheWorld Day’ – an annual event to recognise and promote Parkour. The club’s WeJumpTheWorld Event will be offering a number of one-off community workshops, specifically aimed at; under-fives, parents with children, and the older generation. A speed-competition as well as training and conditioning opportunities for regular members will also be on offer.